This product line is available with RJ-45 Ethernet and RS485 communication. 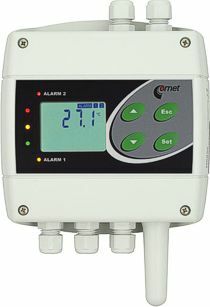 Ambient temperature transmitter with two relay outputs. Temperature transmitter is equipped with three two-state inputs for detection of two-state signals. For example, power presence, water, smoke, airflow, glass break detection, door contact.